"Great leaders have many talents, but one critical skill -- often unrecognized -- is the ability to ask and answer questions. 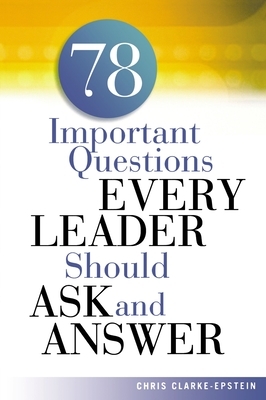 This unique book offers 78 questions that leaders at all levels need to ask and answer both inside and outside the organization. Leaders who master this question-response technique will gain much useful information about what is really going on in their businesses, as well as the admiration of employees, customers, and others with whom they interact. Chris Clarke-Epstein (Wausau, WI) is a consultant, seminar leader, and author of several books, including "The Instant Trainer." A noted public speaker, she is past President of the National Speakers Association.